My kids are really looking forward to Valentine’s Day. It is so sweet to watch their interest in making little gifts and valentines for their friends and relatives. We’ve been busy with a number of Valentine activities already. 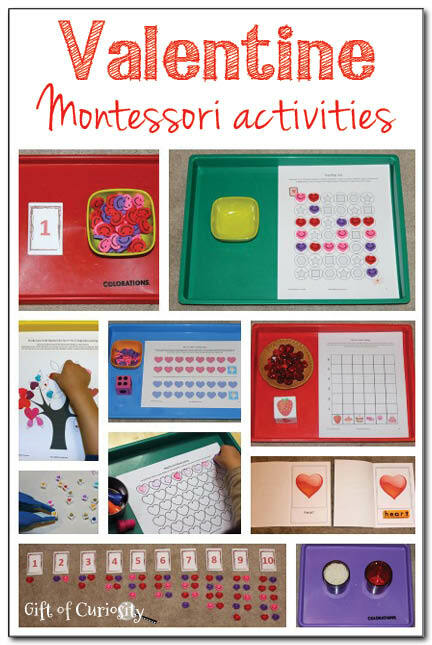 And in this post I’m excited to share with you some of the Valentine Montessori activities that are making an appearance on our shelves for Valentine’s Day! Please note that the Oriental Trading Company items featured in this post were provided to me in exchange for an honest review. All activities using these materials were planned by me and all opinions are my own. See my disclosures for more information. 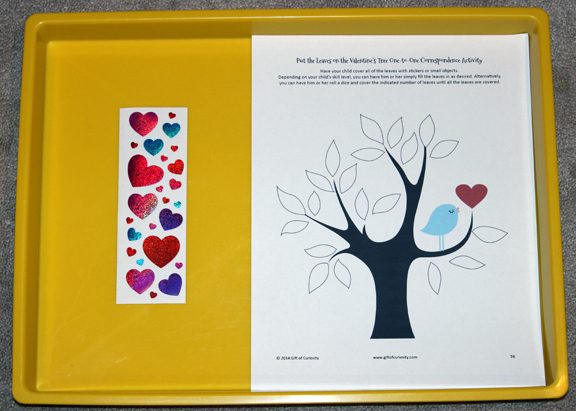 I printed this activity from my Valentine Printable Pack and I included it on a tray with some heart stickers from Oriental Trading Company. 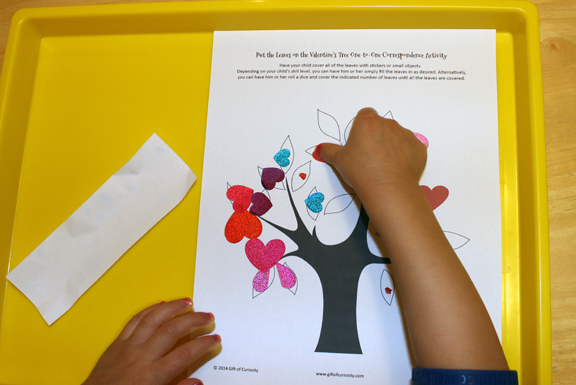 The idea is for kids to place one sticker on each of the leaves. My kids are well beyond needing practice in one-to-one correspondence, but they still do these kinds of activities enthusiastically. Plus, peeling off those stickers – especially the tiny ones – gives their fingers a great fine motor workout! Pouring activities are classic Montessori. I had two small, red glasses that I used for this pouring activity to give it a Valentine feel. I filled one with rice. 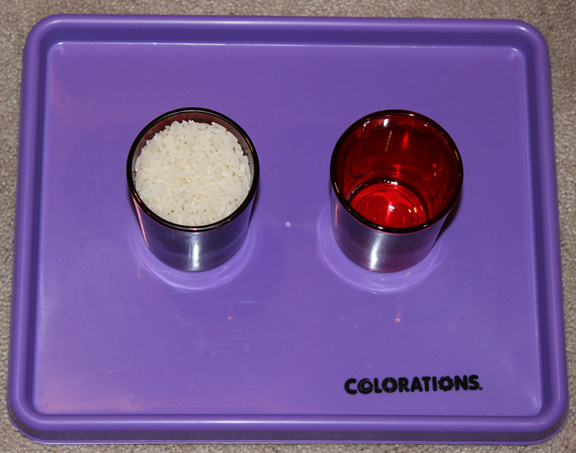 The idea is for the kids to pour all the rice from the first glass into the second one without spilling. This activity is made more challenging by how full the glass with the rice is. 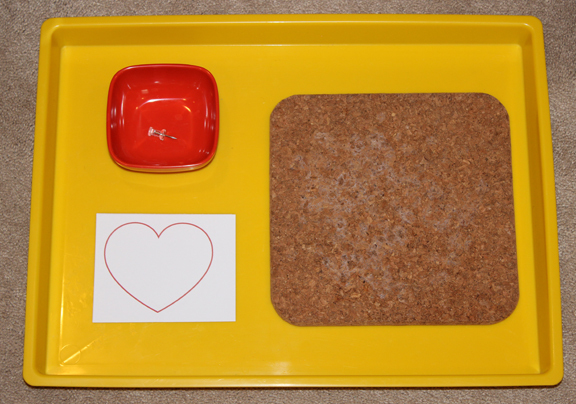 For this activity I put a few heart outlines on a tray along with a push pin and a cork board. The idea is for the kids to put a heart outline on the cork board and then use the push pin to trace the heart outline with holes. 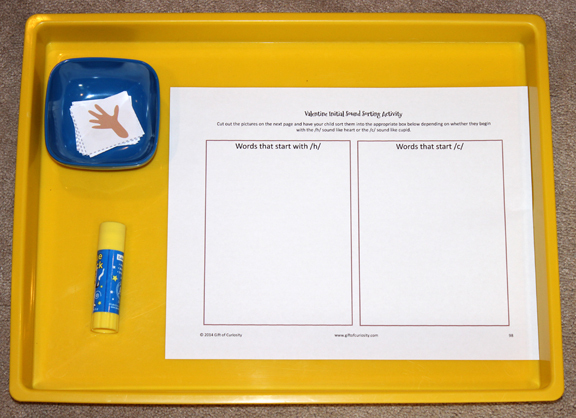 This activity gives kids a great fine motor workout and supports the tripod grip they will use to hold a pencil for writing. 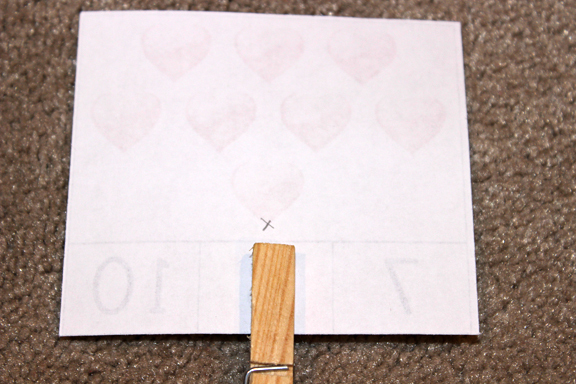 I printed out this Heart Shape Trail activity from my Valentine Printable Pack. I placed it on a tray along with some mini smile face heart erasers from Oriental Trading Company. The idea is to make a trail from the stamp at the top of the page to the letter at the bottom of the page following the hearts. 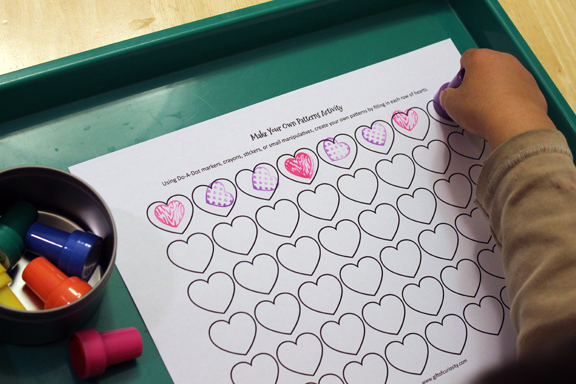 Although this worksheet could be completed using crayons or do-a-dot markers as well, this time I decided to have my kids use the heart erasers to create the trail. 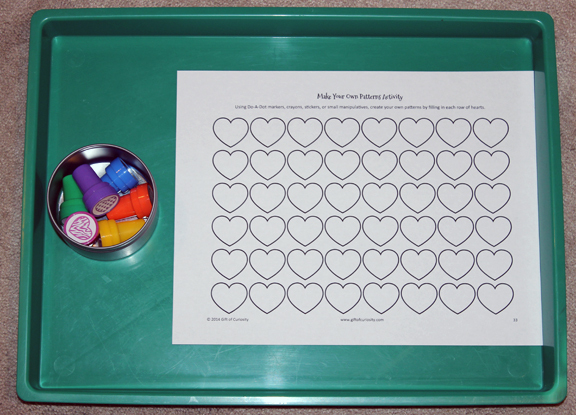 This tray includes the Make Your Own Patterns Activity from my Valentine Printable Pack along with the patterned heart stampers from Oriental Trading Company. Kids can then create their own patterns or continue an already begun pattern using the stampers. My kids have both been interested in patterning lately, and this activity was popular with both of them. For this activity I prepared an egg carton by drawing either one, two, or three dots in the bottom of each well. Then I set it out along with our tweezers and the cube heart beads from Oriental Trading Company. 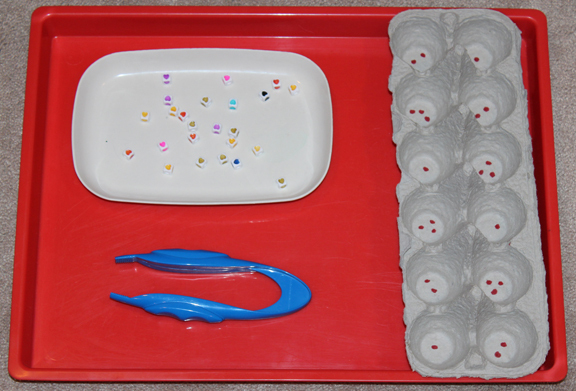 The idea is for kids to pick up the beads with the tweezers and place them into the wells of the egg carton such that the number of beads in each well matches the number of dots. The small size of the beads provides an added fine motor challenge. 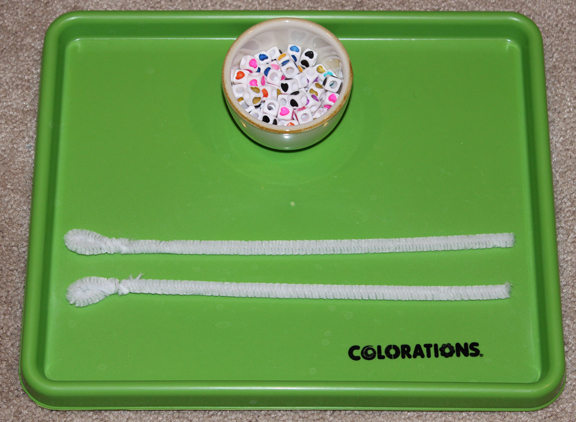 On this tray I set out some pipe cleaners I prepared with a loop at one end. 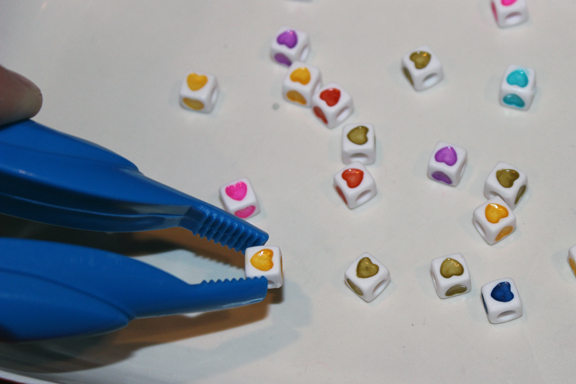 I also included a small container of the cube heart beads from Oriental Trading Company. This activity again works on fine motor skills, as kids have to work to get the tiny beads onto the pipe cleaners. However, the end result is a pretty bracelet they can wear! 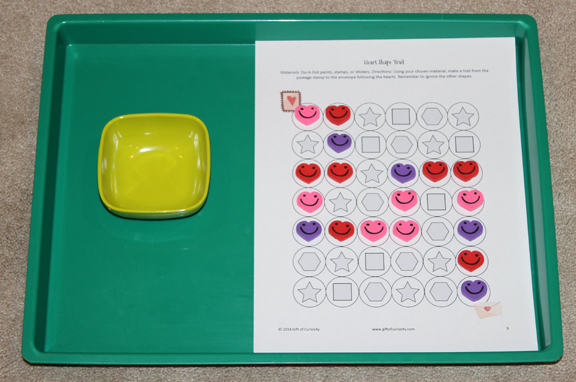 Note that another option for this activity is to provide them a model to copy with a pattern. 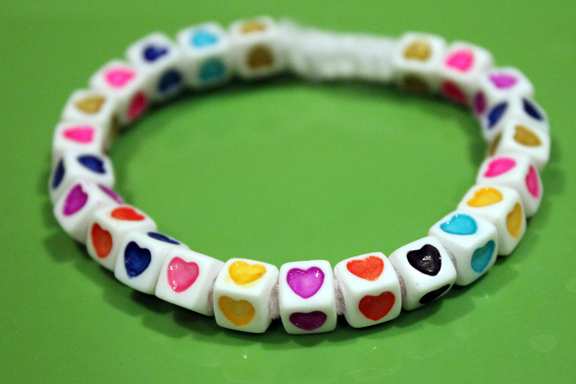 For example, you might give kids a pink, blue, pink, blue pattern and have children create a bracelet by copying it. 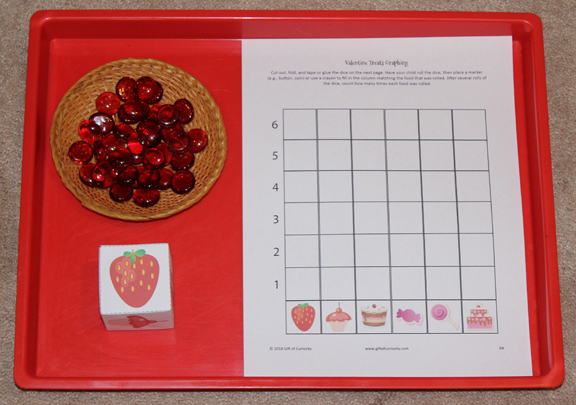 For this activity, I printed out the Valentine Treat Graphing activity from my Valentine Printable Pack. The activity includes a dice you can make as well as the graphing sheet. I added the red glass gems. Kids roll the dice and add a glass gem to the column of whatever object they rolled. For this racing activity, I included pink and purple mini smile face heart erasers from Oriental Trading Company. 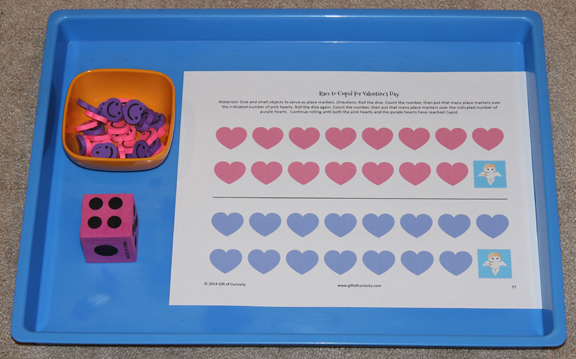 Every time XGirl rolls the dice, she places the indicated number of pink or purple hearts over the hearts on the tray until either the pink or purple hearts “wins” by reaching Cupid. The mini smile face heart erasers from Oriental Trading Company are so versatile, and here’s another activity I prepared that uses them. I printed out the number counting cards from my Valentine Printable Pack and placed them on a tray with the mini smile face heart erasers. 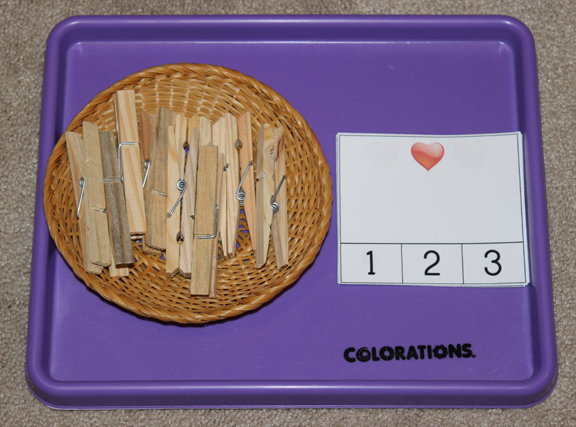 The idea is for the kids to lay the numbers out in order and then count out the corresponding number of erasers underneath each number. 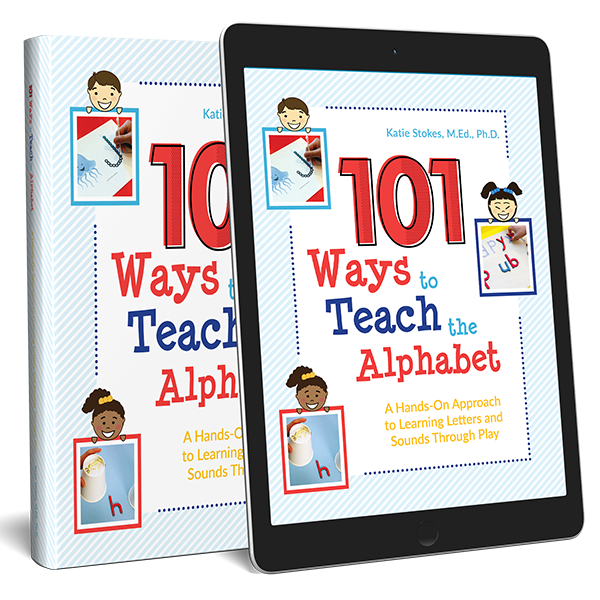 I have my kids lay them out in columns of two, Montessori-style, which will eventually facilitate their learning about odd and even numbers. My Valentine Printable Pack includes three versions of the Valentine grid game with 10-grid, 20-grid, and 100-grid options. On this tray I placed the 100-grid version along with the cube heart beads from Oriental Trading Company and our numbered dice . The idea is to roll the three dice and complete the operation that results (e.g., 1 + 4 in the image below). 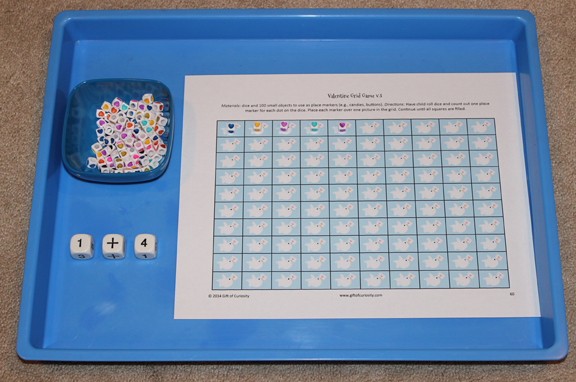 After determine the sum, kids have to place that many beads on the grid. This continues until all 100 squares are filled. These heart clip cards come from my Valentine Printable Pack. I printed them out and placed them on a tray with clothespins. 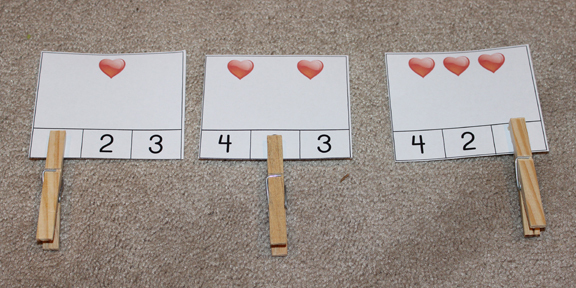 Kids have to clip the number that corresponds with the number of hearts on each card. For control of error, I included a little ‘x’ on the back of each card so my kids can flip them over to see if they selected the right number. 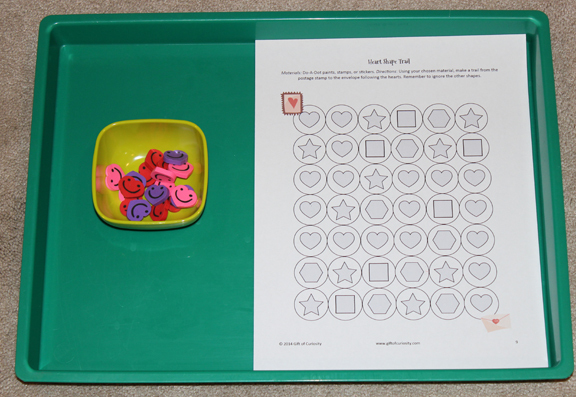 This Valentine Initial Sound Sorting Activity comes from my Valentine Printable Pack. In the little blue bowl are ten pictures – five of which start with the /h/ sound and five of which start with the /c/ sound. 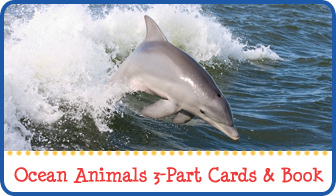 Kids look through the pictures and sort them into the appropriate boxes depending on what sound they start with. If you don’t plan to re-use the activity, you can have your kids glue the pictures when they are done. 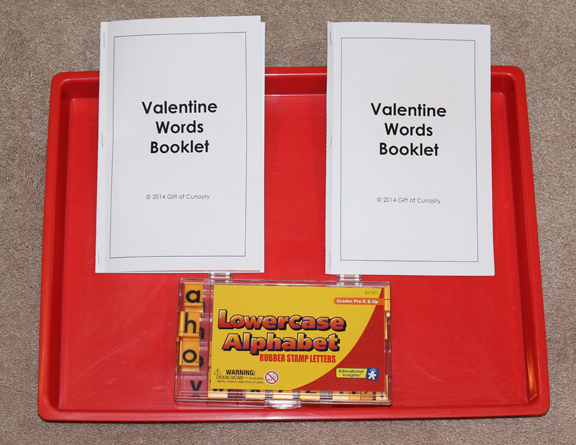 For this activity I created a Valentine Words Booklet printable. 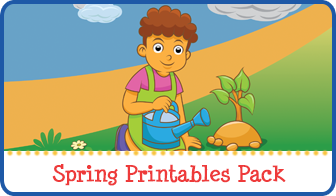 The printable includes several different options for how to do this activity. I chose to create an example book for my kids (pictured on the left). I then printed out a booklet for my kids that includes the pictures but not the words. 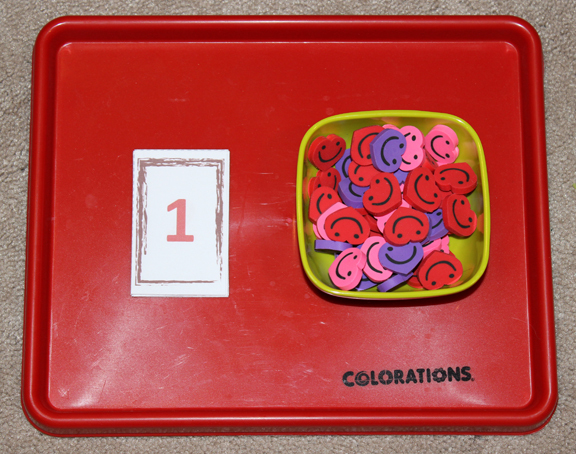 I placed these items on a tray along with our lowercase alphabet stamps . And those are the Valentine activities on our shelves this year! Great ideas! I love that you used multiple pieces in different ways. Definitely going to be trying some of these activities with my kids. We just had some Valentines theme fun in Tot School recently! 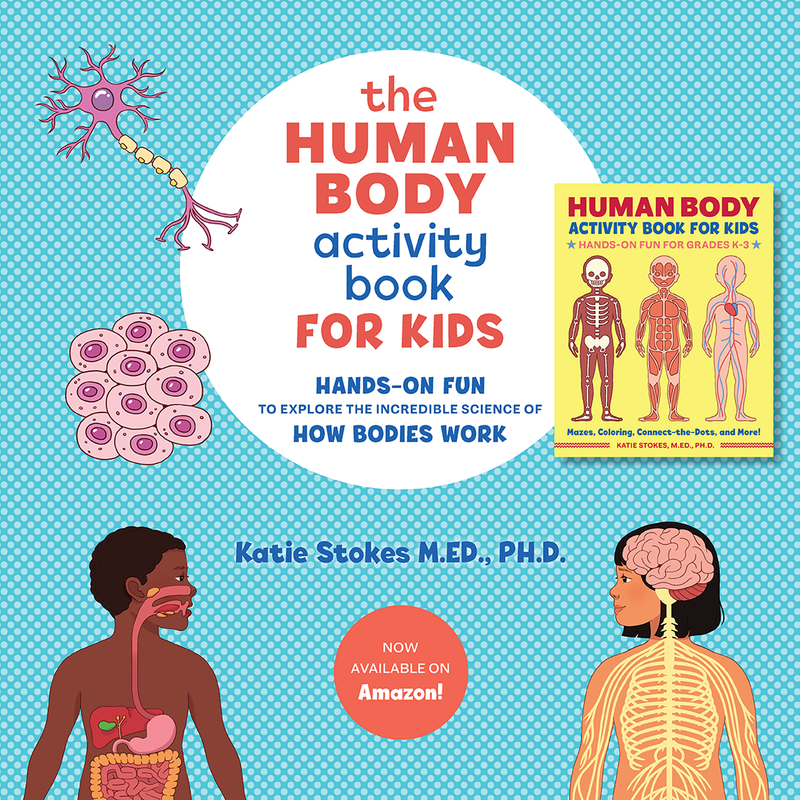 All of your activities looks so fun and engaging! I like your Heart Trail printable. Not sure if my Tot would completely understand the concept, but doing something similar is worth a try! Thanks for the ideas! I have been receiving your emails weekly for a while and using your activities often but never commented before. 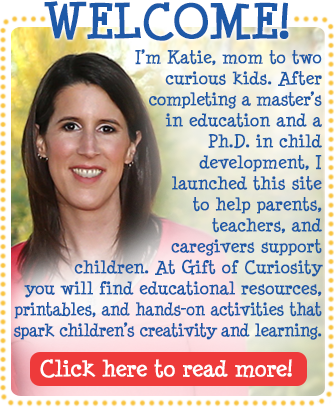 I just want to let you know that I love all your ideas, activities, and printables. I have 4 years-old boy/girl twins and they love it when I print one of your packs. Thank you so much for sharing! I have used some of you amazon links if I didn’t have the components already at hand. These Valentine’s activities are some of my favorite ones ever. Thank you! That’s so kind of you to stop by and let me know. You don’t know how much I appreciate your kind words and support! On tough blogging days (I was up until 2 am last night dealing with server issues! ), it makes all the difference to hear how my work is helping others. Thank you!